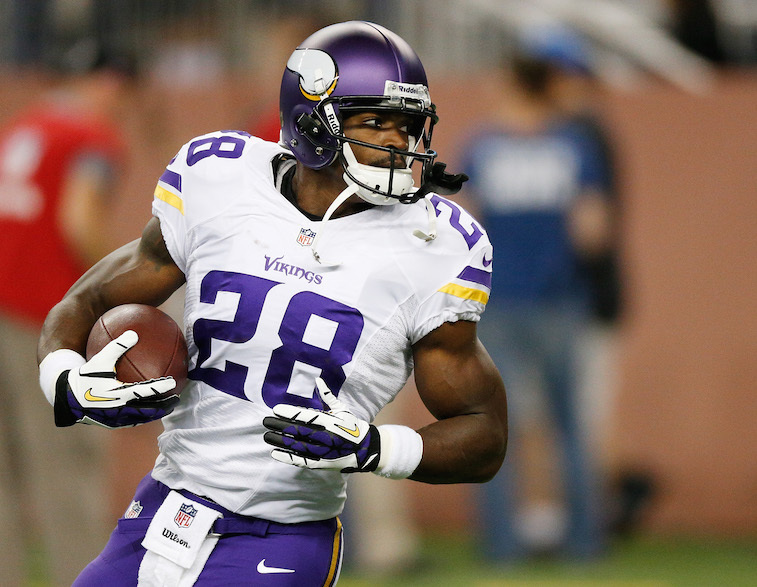 Could Adrian Peterson Actually Break the NFL’s Career Rushing Record? Out of all the things you could say about Minnesota Vikings running back Adrian Peterson, both good and bad, one thing that could never be said of All Day is that he underrates his own abilities. The 30 year old superstar, who missed almost all of the 2014 season over a controversial suspension, is stuck with the Vikes for better or worse, and recently told the Twin Cities’ Pioneer Press that he “[doesn’t] think it’s impossible” for him to break the NFL’s current career rushing yards record, held by Emmitt Smith at 18,355. 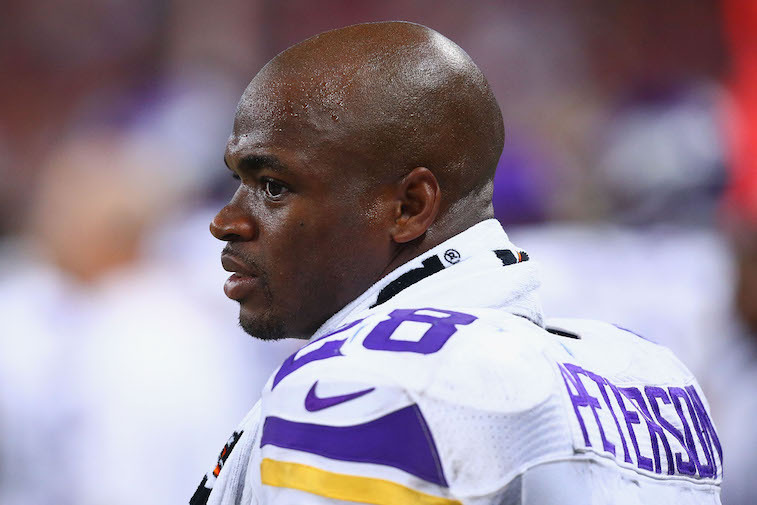 Currently AP, who has played in the NFL for one game over eight seasons, sits at number 28 on the all time chart with 10,190 heading into the 2015 NFL season. So we can’t fault Peterson for his drive, but as a running back who has just passed the 30-year mark we have to wonder if his opinion is tethered at all to reality, rather than simply being a byproduct of his own belief in his athletic abilities. Records are, self-evidently, things that are typically static, and while this is the same player that came back from what many thought would be a career-ending knee injury to challenge for the single-season rushing record (Peterson would finish eight yards short) in 2012, we’re skeptical of his claims. Call us haters, but we’re looking at the mountain that AP has set for himself and we’re thinking it could be a summit he’s not going to reach. Let’s examine what it would take Peterson in order to break Smith’s record, and analyze whether or not it’s a reasonable statement or just the boast of an athlete used to succeeding at the highest level. 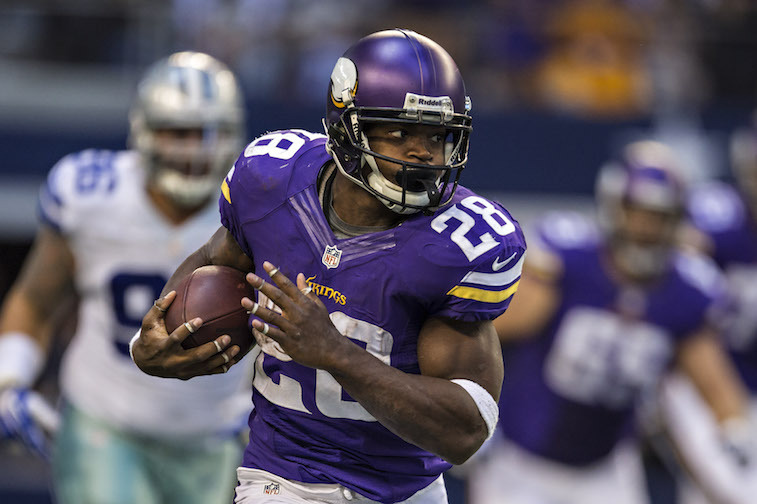 In raw numbers, Peterson would need to rush for 8,166 yards before his retirement in order to break Smith’s record. That seems a little more feasible than you might imagine, particularly as Smith took 15 seasons to set that record and All Day is entering just his ninth — with just the one game he played in 2014. So, if we put Peterson on the same timeline as Smith, he has six seasons to rush for over 8,000 yards. Considering that, to this point, AP has averaged roughly 1,445 yards (we’re leaving out his 75 yard gained last season in the only game he appeared in) per season, playing out six more seasons at full or relatively full health would see him finish out his career at the top of the rushing title, with 500 more yards in total than Smith. NFL players don’t exist in a vacuum, though, and “[i]n the NFL’s 95-year history, there have been 46 instances of a 1,000-yard season by a running back who is at least 30 years old,” per ESPN’s Kevin Seifert, and the last time it happened for a player over the age of 32 was in 1984. Using that as a base, even if Peterson could very well be the exception that proves the rule, we’ll give him two seasons at 1,445 and start from there. So, now, in our hypothetical future, Peterson is 32 and has only 5,276 yards to go between him at the number one spot (he would be safely in the Top 10 at this point). If we assume he is still the central figure of the offense, wherever he is, then 200-250 carries seems like a fair assessment of his workload — consider that Frank Gore, one of two active players ahead of AP on the all time list, ran for 250 attempts last season. Assuming a decline to “just’ 3.8 yards per attempt over the last four seasons over his career, Peterson would average out to 950 yards per season at 250 carries — 3,800 yards in total, and enough for 16,879. Second all time, not quite enough to reach the top. If he can maintain a rushing average of 4 yards per carry at 250 carries, Peterson nets 1,000 yards a season and still falls short. In fact, assuming perfect health and nothing going wrong off the field (or a diminished roll on the field), AP would have to average over 5.2 yards per carry for the rest of his fictional career (remember, this is at age 32 after a pair of average seasons) to reach Smith’s milestone. The last player that was over 32 to average more than 5 YpC was Jim Brown, in 1990. That’s it. He’s the only player that’s done that before. Exactly no one in the history of the NFL has averaged 5.2 YpC on a meaningful amount of carries — for this discussion, we’re going with 150, or a full hundred less than Peterson would need, each season, in order to break the record– ever. Yes, we’re just three years removed from watching the best running back in Viking’s history come within a first down of breaking the single season record, but a 2,000 yard campaign is the exception, not the rule, and if Peterson winds up breaking Emmitt Smith’s career record he will go down as not only the most prolific running back ever but also one of the most extraordinary players on the wrong side of 30 that the NFL has ever seen. All data courtesy of Pro Football Reference.